Capcom's hunting series took a long time to come to PC, but we're delighted it finally made the trip. Tom: Monster Hunter: World is an odd game if you’ve never played it before. The controls feel wrong and the crafting is complicated, and you have to pay cats to make food for you before every hunt. Once it clicks, it’s incredible. The controls are unusual because they have to support 14 wildly different weapon types. It can take a while to wind up big hits, which means you have to learn how monsters fight and predict their movements. It helps that these are some of the best enemies you’ll fight in any game. From the portly and much-victimised Jagras to total bastards like Odogaron, they have their own personalities and quirks. To master Monster Hunter you have to learn their tricks and habits. The electric flying squirrel Tobi-Kadachi leaps up into the trees in forest areas. Rathalos can shatter the rocky dam near its nest if you goad it correctly. Every fight feels dynamic and important. Phil: I love the pace of each hunt, and how it ebbs and flows over time. The slow, determined purpose as you set off to find your quarry. The quiet contemplation as you check your equipment and apply your powders. The frenzied panic as you dodge an enraged beast's attack. The hurried retreat as other, more powerful monsters wade into the fray. The sombre celebration as your target collapses, dead, letting you carve off a pelt that will finally let you craft a new set of trousers. It keeps the action interesting, even as you grind for the best gear, and scales beautifully to multiple players—ensuring co-op play is just as entertainingly challenging as tackling a hunt on your own. Wes: It's staggering how much variety there is in Monster Hunter, and how deep it goes in so many areas. You can call repeating hunts over and over again a grind, but it never feels that way—I'm always getting parts I can use to build some new armor or craft a spear that does lightning damage or crits like crazy. Then if I swap weapons, my role in the hunt totally changes. With a pair of fast-hitting dual blades I'm a tail-severing machine, but with a massive hammer I'm better at stunning massive dinosaurs by clobbering them directly in the face. And once I change weapons, I'm suddenly lusting after a totally new armor set to perfect my build. Monster Hunter is a little bit like 15 different Capcom action games in one, and learning how to use a new weapon's moveset against a particular monster is a rewarding challenge every time. It's definitely the game I've poured the most time into this year, and there's still so much I want to do. Higher tiers of monsters add new challenges to fights, though they mostly just hit harder and don't stun as easily. But I don't really mind, because the basic mechanics of combat just feel so damn good. I'll happily fight them over and over again, even without the lure of getting better augments for my high-end gear. But also, that part has its claws in me deep. Capcom keeps rolling out seasonal events, crossovers, and new versions of monsters to fight, and I want to take on each and every one of them. Pip: I thought I was enjoying Monster Hunter World and then it wanted me to kill Pukei-Pukei. NEVER! Pukei-Pukei manages to be both the most extra and the most derpy of the monsters. It’s all rainbow feathers and tongue and eyes and why can’t I be its friend instead? 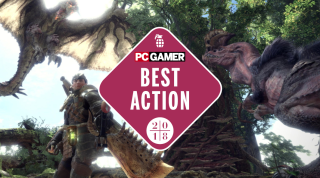 Find our original Monster Hunter: World review here.